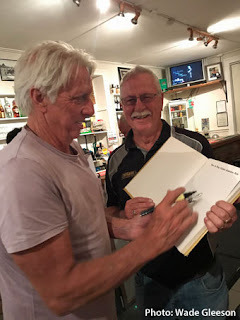 Jeff Thomson signs a book for Phil Sharpe. IT was all cricket talk at the Gretna Green Hotel last Friday night where a large crowd gathered to hear the stories of former Australian fast bowler Jeff “Thommo” Thomson. Regarded as the fastest pace bowler of all time, Thomson mingled with cricket fans and locals in what was a great meet-and-greet session. Thomson gave a very good talk on his career, how it all started and the players he played both with and against. When he had finished his playing career and was coaching Queensland at the age of 45, Thommo would train with the players and remarkably was still quicker than his fastest bowlers in the team. He was encouraged to pull the whites back on but the youth policy at the time prevented a comeback — but he still had it even many years on. Auctions of memorabilia were conducted by Rob Hillier who travels around with Thomson on his visits. Raffles were also run and won and some memorabilia was for sale. Many people brought their own memorabilia which Thomson was more than happy to sign. In all it was a great evening. A big shout out to Phil and Colleen Sharpe of the Gretna Green Hotel for putting on the occasion — well done.